If the atmosphere at the papal mass in Zayed Sports City was charged, the homily by Pope Francis was electric, assuring the faithful that living a life as ordained by Jesus 'does not require dramatic gestures'. In living a Christian life we do not need "to build great works or draw attention to ourselves with extraordinary gestures. He asked us to produce just one work of art, possible for everyone: our own life." For the homily, the Pope chose a well known passage from the Gospel according to St. Matthew Chapter 5 which is also known as the Sermon on the Mount. The first few verses are known as the Beatitudes or the Blessed Attitudes. It was delivered by Jesus early in his ministry and has been quoted widely in and outside the church. Mahatma Gandhi once said: "The Sermon on the Mount went straight to my heart." The word linking the sayings of Jesus in this sermon is 'Blessed', and the Pope chose this word to begin his homily. "The Christian life means living out the joy of this blessedness, wanting to live life as a love story, the story of God's faithful love, he who never abandons us and wishes to be in communion with us always." The pope reminded the congregation that the words of Jesus in this chapter overturn popular thinking, according to which it is the rich and the powerful who are blessed, those who are successful and acclaimed by the crowds. "For Jesus, on the other hand, blessed are the poor, the meek, those who remain just even at the cost of appearing in a bad light, those who are persecuted. The pope reflected on a dilemma many Christians face today - Is it possible to live according to the teachings of Jesus while living in this world? Do we follow Jesus or the world? The pope answered this by pointing towards the life of Jesus himself - poor in respect to things, but wealthy in love; he healed many, but did not spare his own. "He came to serve and not to be served; he taught us that greatness is not found in having but rather in giving." The message reflected the life of Pope Francis who is not encumbered by the trappings of power, but lives a life as close to those who do not have, the downtrodden and the outcast. While thanking the people for living out the gospel, he quickly noted that living a life of blessedness does not mean being cheerful always. "It is most certainly not easy for you to live far from home, missing the affection of your loved ones, and perhaps also feeling uncertainty about the future." In saying this he struck a chord with the thousands gathered at the stadium, living hundreds of miles away from their loved ones and concerned about the future. The focus on simple living was underlined when he said: "The Beatitudes are not for supermen, but for those who face up to the challenges and trials of each day." "Those who attack or overpower others are not blessed, but rather those that uphold Jesus' way of acting..." He quoted St Francis as saying that Christians are armed only with their humble faith and concrete love. 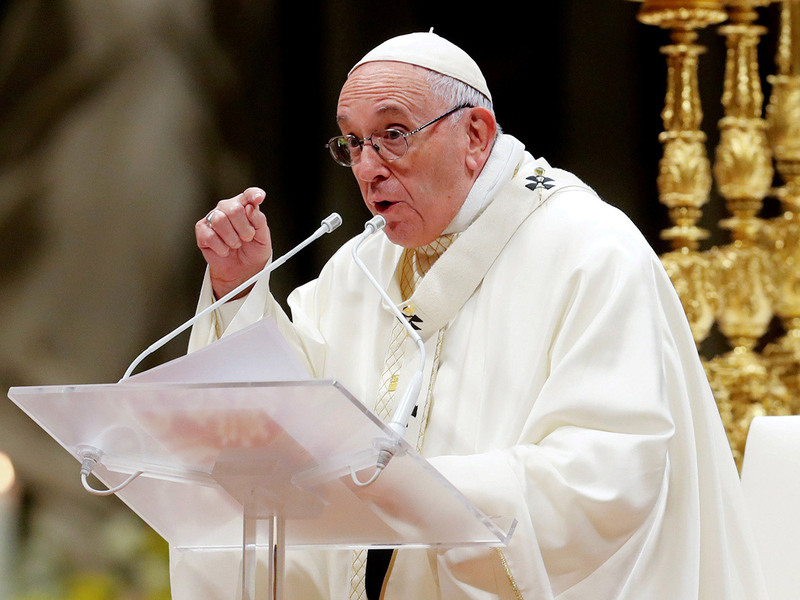 Echoing what the pontiff said at the inter religious meeting yesterday, the Pope urged the church to preserve peace and unity and take care of each other. He likened the church here to that in Philadelphia, mentioned in the Book of Revelation. Of the seven churches mentioned in that book, it was the only one which was not reproached. The depth of the message by the Pope, his personal touch in understanding the feelings of the people and the assurance that we are already blessed made it a sermon that will be well remembered.